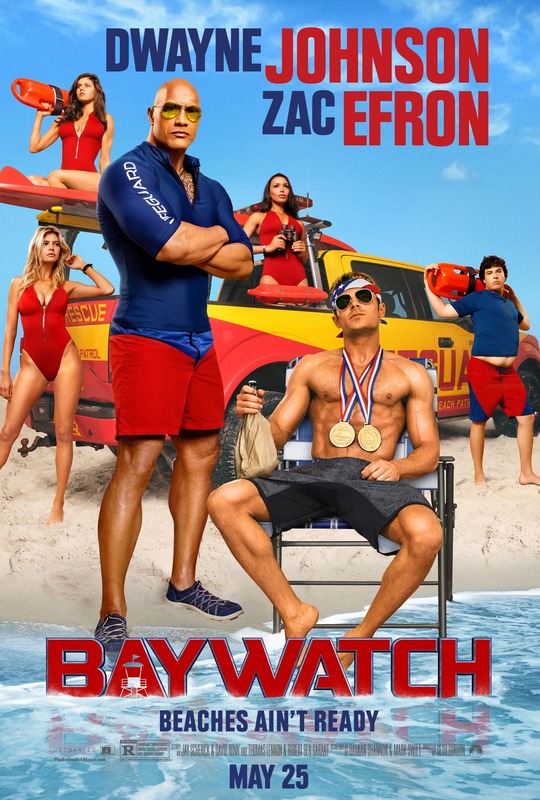 Thanks to the popularity of Dwayne "The Rock" Johnson and a run of very funny TV commercials, I imagine "Baywatch" will have a huge opening weekend. But having seen it, I doubt many who turn out, will rush to recommend it. Frankly "Baywatch" isn't very funny. Based on the 1990s TV series about lifeguards and bikinis, the movie follows the same formula with a dumb plot about a villain murdering people, so she can buy up the beach and turn it private. The Rock looks like a statue in his Speedo. Zac Efron shows off his double six-pack abs, which look a little ridiculous. The women look amazing, especially Kelly Rohrbach, who gets her own subplot with Jon Bass, a would be lifeguard who literally can't breathe around her. Some comedies have good luck playing off nostalgic TV series, most notably "21 Jump Street" and its sequel. By the time David Hasselhoff and Pamela Anderson make their expected cameos, "Baywatch" the movie has turned into a wheeze from trying too hard. "Baywatch," 1 star, rated "R." Does it deliver what it promises? Weak comedy, based on an old TV show. Is it entertaining? Long stretches with few, if any laughs. Is it worth the price of admission? Skip it.